Aurora Kakadu hotel is set in the lush surroundings of the world heritage listed Kakadu National Park. It is located in the South Alligator region of Kakadu, just 2km from the river. You can marvel at the stunning wildlife from this unique property. The spacious, comfortable rooms offer wonderful views of the tropical surroundings, and all feature either a balcony or terrace with beautiful scenic views. 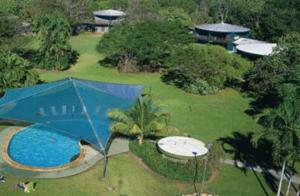 Guests can enjoy the resorts' refreshing swimming pool and spa, tennis courts, billabong walking tack and BBQ facilities. WiFi access is available. The Munmalary Bar and Bistro & Wetlands Restaurant (seasonal) offer a choice of local and international dishes every evening. A hot or continental buffet breakfast is also available to all guests each morning including freshly baked pastries, muffins and seasonal fruit. Seasonal tours to explore the areas’ famous waterfalls, billabongs, escarpment and wetlands are all bookable through the resort. Fuel, groceries and souvenirs are available from the resort shop, open daily. Travel: Directions to Aurora Kakadu - 220km from Darwin. Turn left from the Stuart Highway onto the Arnhem Highway. Aurora Kakadu is situated 2km from the South Alligator River, 43km before reaching the township of Jabiru.